It has become increasingly clear that organizations creating a sustainable right to win have the trustworthy, timely data at their fingertips that they need to make transformative business decisions. Most manufacturers, however, find their data to be siloed and their manufacturing data in particular to be largely disconnected from the rest of their business processes. The reasons for this are numerous, but largely stem from the incompatibility and un-contextualized nature of manufacturing measurement. This prevents manufacturers from doing the systematic analysis that is needed to solve many of their critical business problems. This results in higher costs, greater difficulty in driving process improvement, trial and error manufacturing line analysis, lower productivity and a general inability to drive real innovation out of manufacturing and business initiatives. Manufacturers find it difficult to manage customers and vendors. Today’s manufacturers are being pushed by what seems to be continual price reducing behavior from their customers. To respond, they need to increase productivity, drive greater yields and increase operational efficiencies. At the very same time, component manufacturers are finding that they need to deal with customers’ erratic ordering patterns—Just In Time (JIT) Manufacturing approaches are usually a major cause of these issues. JIT makes it difficult to forecast demand. Making the problem even worse is the length of manufacturing lead times, which means that manufacturers need to create inventory in advance of demand. In addition, manufacturers need to better manage their 3rd party vendors and establish the ability to seamlessly and immediately detect product problems and sources. One limiting factor is the current proprietary manufacturing sensor-controller-actuator architecture stack. It limits the ability to combine source data across systems and to use predictive analytics to solve many manufacturing problems. 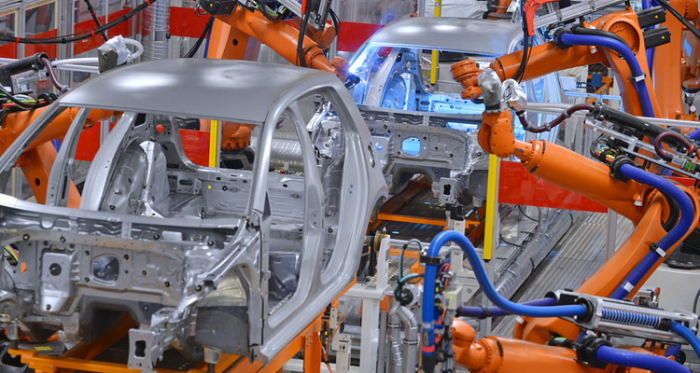 What most manufacturers want is the ability to connect manufacturing source data to the data from legacy business and planning systems. Doing this requires connecting incompatible manufacturing source data to each other. To do this well, they need to move from tacit knowledge of sensor data noise and towards an automated correction of sensor source data. This step means that automated prescriptive actions can be done from in flight, from sensor data. By taking this step, manufacturers will be able to discover relationships between data as well as potentially predictive variables. Being able to apply predictive analytics and machine learning to real time and historical time series data is a critical step forward once source data has been corrected and contextualized. The image below shows the nirvana state of having the ability to connect the chain of suppliers to manufacturing to distribution to customers. The manufacturers who achieve this will gain a competitive advantage and strengthen their right to win. The one thing that is clear is that manufacturing problems today are by essence cross domain. They require the ability to discover problems versus symptoms. And to do this, (in contrast to other Big Data opportunities) the data needs be contextualized and corrected before it is analyzed or used. With this, we have an opportunity to solve the big problems in manufacturing. What is missing is the intelligent data layer to take manufacturing data sources and make them useful in solving the above problems/opportunities. This is for both continuous and discrete manufacturing. This can get all the relevant structured data sources right at the same time. This eliminates the need to go to the controller or SCADA system for data. But how do you go direct to the sensors? You accomplish this by building on the ability to contextualize and correct data on the fly as it is going into the Data Lake and Hadoop or prescriptive analytics. This is where data quality capabilities are essential. With data streaming and complex event processing, you have the potential to deliver on prescriptive analytics and BPM (to take action). With this, predictive analytics powered by machine intelligence capabilities can enable modeling once problems (versus symptoms) have been discovered. With data discovery, the relationships can be demonstrated. At the same time, you can join data from suppliers on products and customers and integrate to the cloud. This powers you to connect and discover the interrelated process problems. Three macro changes clearly have the potential to impact and change manufacturing for good. All of them require contextualized, corrected data. All of them need the ability to discover, integrate and consolidate data from many sources. All enable manufacturing to optimize and connect itself to the rest of the business. This is a big opportunity for manufacturers if it is done right.